The first performance was in 2012 at the Royal Academy of Music, London by the Piatti Quartet who have since played ‘Fuzon’ many times. Other performances include Brighton Philharmonic Chamber series in 2016 and in Hampstead in November 2017. Parts and study score available from Comus Edition. ‘A welcome addition to the string quartet repertoire’ – TEMPO, April 2013. Performed and broadcast many time worldwide, ‘Urizen’ was recorded by Paul Silverthorne and John Constable on Black Box Classics. ‘Urizen’ was first published by Patricia McCarty’s Ashmont Music, then by Boosey & Hawkes and now by Comus Edition. Tri (for six violas), 2007, three movements. c.10’00”. The first movement was premiered at the International Music Academy of Solsona in Spain in 2007 and later by the violas of the Helsinki Symphony Orchestra. All three movements were performed at the Royal Welsh College of Music & Drama in 2008, at the Royal Academy of Music in 2012 and at the Guildhall School of Music in 2016, 2017 and 2018. Score and parts are available from Comus Edition. A dramatic single movement with obligato viola solos. Score and parts available from Comus Edition. Commissioned by Peter Mallinson and Matthias Wiesner whose 2017 CD ‘Music for Two Violas’ is on the Meridian label. The title comes, of course, from Woody Allen’s ‘I am at two with nature’. These are not for beginners! Three self-explanatory short movements. First performance was at the Cheltenham Festival 2015 with Jessie Ann Richardson. Subsequently performed at the Presteigne Festival 2016 by Alice Neary. Published in 2015 by Comus Edition. – Virginia Woolf, ‘To the Lighthouse’. Originally written for flute and ‘cello, now rewritten for violin and ‘cello. A lyrical piece which looks at Orpheus, who yearns for Euridice and cannot resist the fatal backward look. Piano score and part are available, from Comus Edition. First performed by Siân Philipps and Per Rundberg in 2016. Commissioned by the Haworth family for their violist father’s eightieth birthday. A condition of the commission was that, in case of absent family members, the 2nd violin part should be idiomatically playable by a second cello! Originally written as part of my ‘cello Sonata (1973), these three movements were revised in 2016 to make an effective suite. Originally for treble recorder and harpsichord now recomposed with viola. A coronach is a celtic lament, but this one becomes quite powerful and dramatic. Each movement is created from a different repeating ground resulting in some passionate and virtuosic music. A very dramatic piece based on the extraordinary Adventures of Simplicius Simplicissimus, the 17th-century story of a young boy travelling through a world ravaged by the Thirty Years’ War and the appalling things he both sees and does. The surprisingly lyrical, and ultimately sad, Edward Lear poem – much more than mere nonsense! The clarinet version has been recorded – with Steve Dummer, clarinet and Aidan Smith, baritone – for Claudio Records for release in 2019/2020. The first performance was in 2017 with Nancy Ruffer (flute) and Dominic Saunders (piano) at St John’s Hampstead. 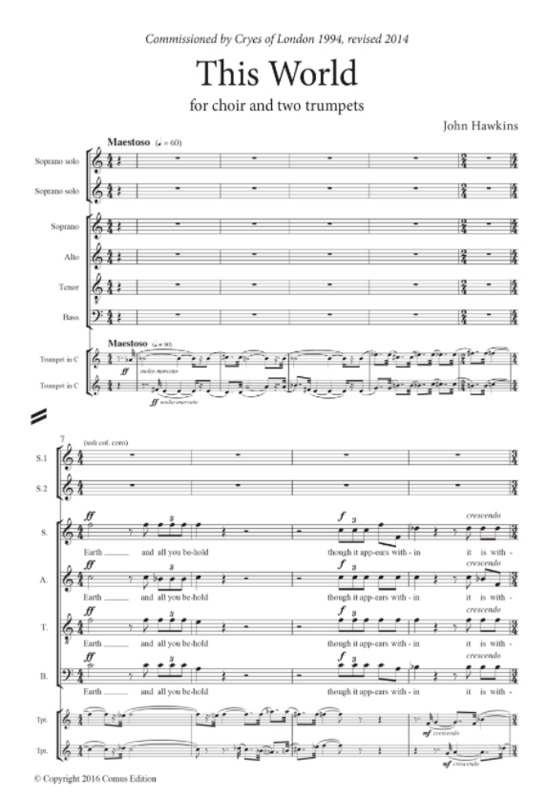 Score and parts are available from OnlineSheetMusic. The Sonata will be performed at the 2019 Presteigne Festival. Written in 1972, this sonata had its first performance in 2016(!) at the Chapel Royal in Brighton with Steve Dummer (clarinet) and Yoko Ono (piano) and was repeated by them soon afterwards. First performed by Daphne Down in 1973. 2nd performance (!) in 2018 by Steve Dummer and The Musicians of All Saints. Three movements: ‘Touching In’, ‘Don’t Touch’ and ‘Touch and Go’. Three short pieces with an American feel. c. 7mins. First performance by Sussex Flutes, March 2016. Composed in 2015 for the outstanding British recorder player, John Turner, who gave the premiere performance of ‘Coronach’ in September 2015. The title refers to the traditional improvised singing at a wake in the Highlands of Scotland and in Ireland. Witty, perhaps, and tricky, ‘Brief Encounters’ is recorded on the ‘Voices from the Sea’ CD played by Nancy Ruffer and Paul Silverthorne. Please contact me for score and parts. Published by Elysian Edition in 2014 in the original solo oboe version and in a later version with added string trio (the oboe part remains the same) which has been performed by the Orchestra of St John’s chamber group. The solo version was recorded by Chris O’Neal on the ‘Voices from the Sea’ CD. A winding and unwinding single movement: atmospheric and dramatic. Score and parts from me. 2 flute parts, 2 oboes, 4 clarinets, 1 bassoon, 2 horns. As many of each as available! Score and parts available from me. These Lovers (flute and ‘cello, c. 5’00”) – also rewritten for violin and ‘cello in 2016. As its name implies, this is a light piece for woodwind trio rather in the Françaix style. The protagonists never quite agree on key or time signature but there is a happy ending. Score and parts from me. Short, romantic and slightly antique. First performed by the Duruflé Trio in June 2018. Now in a completely new version for flute, viola and harp. First performance by The Riot Ensemble 28th October 2017. 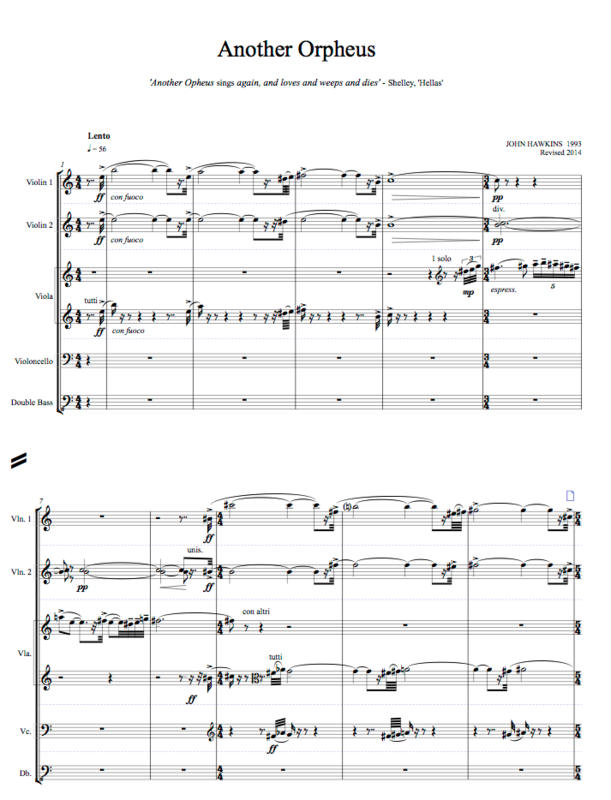 Score and parts published in 2015 by Comus Edition. Silk Road 2013 (tenor voice, violin, viola, ‘cello and piano) c. 5mins. In Touch 2016 (clarinet, ‘cello and piano). 9 minutes. Three movements ‘Touching In’, Don’t Touch and ‘Touch and Go’. 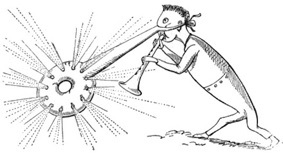 Mouth Piece is a short (c. 3 min) showpiece for trumpet (C) and piano. Written in 2017 it moves between bluesy and toccata styles. First performance was by Fraser Tannock and Terence Allbright in September 2017. In this short piece I imagine such a walk, with Mme Ingres’ poise broken by increasingly frantic evasions which are both ridiculous and perfect;y serious. Sortie (trumpet and organ) c. 5’00” is available on the CD ‘North Star’ on the Deux-Elles label (DXL 1097) played by Deborah Calland. The clarinet version has been recorded – with Steve Dummer Clarinet and Aidan Smith, baritone, for Claudio Records for later release. With words by Alison Rutherford, these cabaret-style songs range from the sentimental to the downright frightened. ‘Rintrah Roars’ having been performed, (see below) I have rewritten it for voice and piano (without harp) and added two further songs on Blake texts – ‘The Bard’ (from ‘Songs of Experience’) and ‘Thel’ – to complete the cycle. The words are taken from Blake’s ‘Marriage of Heaven and Hell’ and make for a short, dramatic, rhetorical piece. First performed by April Fredrick and the Riot Ensemble in 2016. An intriguing double commission for both Cecilia McDowall and myself to write settings of the same poem! The poem, by Sarah Pope, is powerfully atmospheric and was commissioned, like the music, by violist and music publisher John Harding in memory of his sister Pauline. John worked for many years in China for the BBC. Float on the air’s charm. Poems about music by various authors, including Herrick, Shakespeare, Tennyson and Marvell. Three poems by Edward Thomas: ‘Like the touch of rain’, ‘Out in the dark’ and ‘The Unknown bird’ . There will be a performance at the Petersfield Festival Hall, on Friday 17 March 2017 as part of the commemoration of the centenary of Edward Thomas’ death. Voices from the Sea (song cycle for tenor with string orchestra) words by merchant seamen See recordings. The libretto dramatically contrasts words from the Anglo-Saxon ‘The Seafarer’ and the short story ‘Letter Unsigned’ by Liverpool seaman, poet, actor and activist George Garrett. 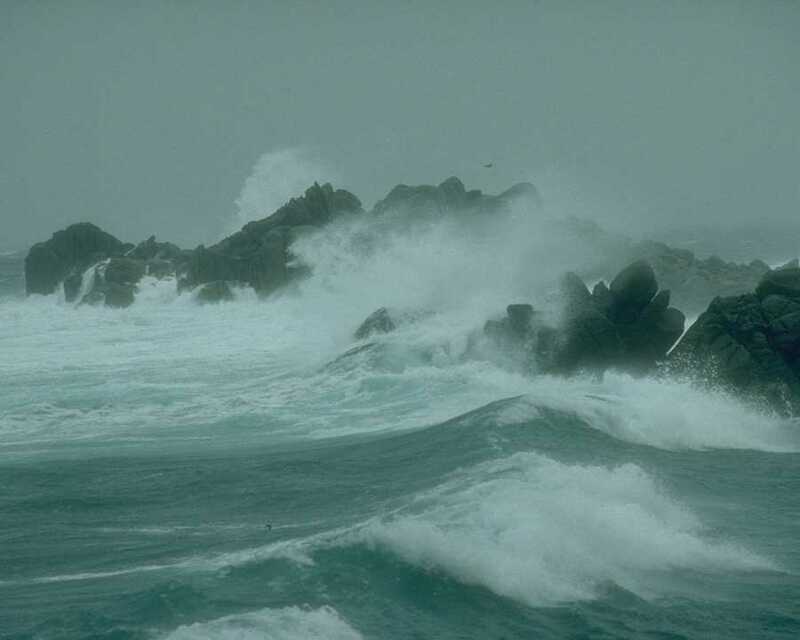 This, the final part of my Sea trilogy, is still looking for its first performance, but I have extracted one section [‘Fate is More Strong’] as an anthem for unaccompanied SATB choir, and this was first sung by the choir of Westminster Abbey. Score and parts available. This World (for SATB choir, including two soprano soloists, with 2 trumpets) words from William Blake and the Book of Job c. 9 mins. Broadcast by the BBC Singers. Perhaps in Hope (anthem for Remembrance Day for SATB choir): words by Penny Britten. First performed by the choir of St Margaret’s Westminster. I Know What I Like (SATB choir) an imitative history of music in variations on Schubert’s ‘An die Musik’. ‘For These …’ (SATB choir) blends words from the Te Deum and war poet Edward Thomas. Commissioned and performed many times (including at Liverpool Cathedral) by the Manchester-based choir Alteri. Available from OnlineSheetMusic.com. Another New Year (SATB choir) c. 3 mins First performed by the Petrus Singers 2004. Sense and Nonsense (SATB choir) poems by Mervyn Peake. Virtue, Denial, The Call and Doomsday (SATB) Poems by George Herbert) c. 7 mins. First Performed by Alteri 2004. Published by Fountayne Editions 2014. The Song of Three (SATB choir, violin, flute and speaking/clapping chorus, 2017, c. 5 mins), uses a Sussex folk song ‘The Seasons of the Year’ [traditional words and tune] together with a setting [by me] of Rudyard Kipling’s ‘The Song of Three’ – the three in question being the weald, the marsh and ‘the white chalk coast’. Some great Sussex words creep in – ‘tossicated’, ‘flittermouse’, ‘beazeled’ and ‘dumbledore’! First performed in Alfriston (Sussex) in 2017, immediately followed by performances in the (also Sussex) towns of Uckfield and Horsham. A short concertino. Each movement is created from a different repeating ground developing into some passionate and virtuosic music. The title comes from a fitful, fast, many-times-repeated melody which appears in contrasting instrumental guises throughout this dramatic piece. Double wind, brass, timpani (1 player) 1 harp, percussion (1 player) and strings. Urizen (versions for solo viola with string orchestra or mixed chamber orchestra) published by Comus Edition. Another Orpheus (string orchestra with obligato viola solo) 1 movement 8’00”. 1993, rewritten 2014. First performed by Daphne Down in 1975. 2nd performance (!) in 2017 by Steve Dummer and the Musicians of All Saints. Echoes a chamber opera for two sopranos, mezzo-soprano, tenor and chamber group (flute, oboe, clarinet, horn, trombone and harp). Libretto by Anne Harris. c.25 minutes. Commissioned by and performed in Covent Garden’s ‘Garden Venture’ series at the Riverside Studios in 2009. Contact me for printed copies. ‘Samba-Cha’ and ‘Least said…’ for trumpet and piano written for publishers Stainer and Bell published in 2007. ‘The wide variety of compositional approaches is exemplified by John Hawkins’s minimalist writing. ‘Least Said’ is energetically purposeful … in contrast to his more carefree relaxed ‘Samba-Cha’. ‘Break Even’ for saxophone and piano was written for Faber Music’s ‘Fingerprints’ series (published in 2006).